Hope is dwindling for dozens of North Korean defectors detained in China with Beijing apparently making preparations to repatriate them to their homeland, a lawmaker here said. Rep. Park Sun-young of the minor opposition Liberty Forward Party (LFP), citing sources in China, said that nine of the would-be defectors were being transferred to the border city of Tumen where they would be handed to North Korean authorities in the coming days. Park said Chinese authorities also planned to repatriate 10 asylum seekers being held in Shenyang and five in Changchun from the same location. The case of the 24 detainees, who have been held since early this month has garnered international attention due to the North’s reported harsh punishment of those who attempt to defect. China’s policy of repatriating North Korean defectors is a thorny issue between Seoul and Beijing, as many of those who escape intended to travel to the South, where they are granted citizenship. Beijing repatriates North Korean refugees under a deal made with Pyongyang, its ally. 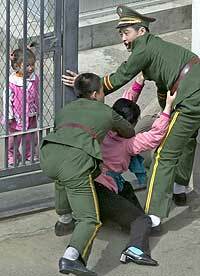 Human rights activists say those repatriated face harsh punishment including torture and imprisonment in labor camps. The 24 were arrested in three groups, according to Park. The groups of nine and 10 were detained Feb. 8, the group of five two days later, the lawmaker said. The group of ten was arrested by Chinese police at a bus terminal in the northeastern Chinese city of Shenyang on Feb. 8. They had planned to travel to South Korea to unite with family members. Among them was a 19-year-old girl whose parents are living in the South and a 16-year-old boy with an older brother here who is a South Korean citizen. Tens of thousands of North Korean defectors are believed to be hiding in China, hoping to travel to Thailand or other Southeast Asian countries before resettling in South Korea, home to more than 23,000 North Korean defectors. The meeting comes as the North has apparently ordered a harsh crackdown on defectors in the aftermath of the death of its longtime ruler Kim Jong-il late last year including shoot-to-kill orders. Reports emerged last month that three would-be defectors were shot dead as they attempted to cross the Amnok River (Yalu River). The report followed others that Pyongyang tightened border controls before the announcement of Kim’s death. Other reports have circulated that the crackdown includes nail-studded barricades and stepped-up threats of execution for the family members of those who are caught defecting. Reports also say North Korean agents are targeting humanitarian workers in China seeking to facilitate the defections. Observers said the harsh measures were likely an attempt to intimidate others from fleeing as mass defections could destabilize the fledgling regime of Kim’s youngest son, Kim Jong-un, who is being installed as the new leader. A foreign ministry official said China had not confirmed the repatriation, Yonhap News Agency reported. Seoul and Beijing will reportedly hold talks later this month on the issue of North Korean defectors detained in China.